Etihad Airways, the national airline of the United Arab Emirates, has unveiled the new product and service offering on its Airbus A380 and Boeing B787 Dreamliner aircraft, including The Residence by Etihad, the world’s most luxurious living space in the air, available only on the airline’s A380 aircraft. The Residence will be the breath-taking and completely new forward upper-deck cabin on the A380. Accommodating single or double occupancy, it features a living room, separate double bedroom and en-suite shower room. Customers in The Residence will also have a personal butler. The A380 will feature revolutionary First Apartments, which are fully private suites with a separate reclining lounge seat and full-length bed, as well as a chilled mini-bar, personal vanity unit and wardrobe. The system has video touchscreen handsets, offering an additional screen for customers to maximise their entertainment, so they can play games or view a moving flight route map while watching a movie. The new cabins and service offering follow the airline’s pledge to transform air travel and make every customer journey a remarkable one. 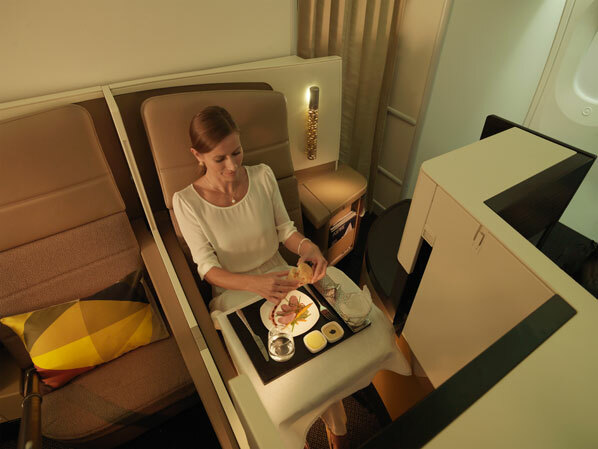 James Hogan, Etihad Airways’ president and chief executive, said: “These new living spaces will raise inflight product and service standards to their highest level yet in commercial aviation and alter air travellers’ expectations of inflight comfort and luxury forever. 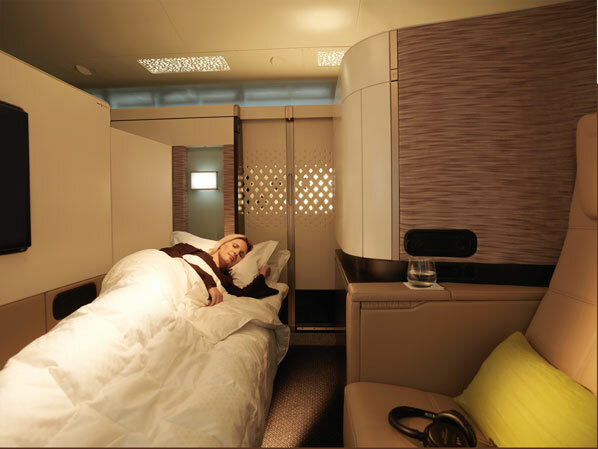 “Etihad Airways’ A380 and B787 will deliver the most advanced airline cabins in the industry, while meeting all weight, range and cost targets at our desired seat count. Believing that no single design agency could deliver its vision for the new cabins, Etihad Airways established in 2008 the Etihad Design Consortium which brought together three leading British design companies, Acumen, Factory design and Honour Branding to develop innovative cabin and seat designs for the new fleets. The EDC collaborated with Promise Communispace, a leading agency, to launch comprehensive consumer research and workshops in London, Abu Dhabi, Sydney, and New York, with the goal of understanding what makes a ‘perfect flight’ and asking consumers to help design the perfect airline. 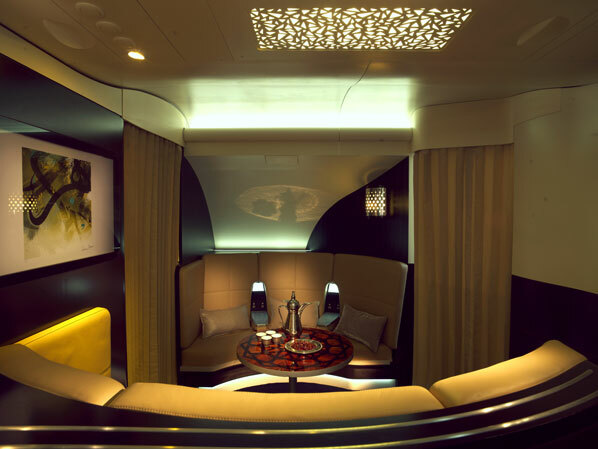 Etihad Airways’ design vision was to bring the individuality and exclusivity of a luxury boutique hotel experience to the sky in a way that embraced Arabian modernism, an aesthetic that combines the traditions of the Middle East with contemporary design. The Residence, which is certified by the European Aviation Safety Agency for single or double occupancy, offers levels of luxury and total privacy normally found only on private jets. Each Etihad Airways A380 will offer a boutique version of The Residence with different colour palettes, table marquetry and custom carpets. Customers in The Residence will have the services of a personal butler throughout their flight. These fully trained service professionals will receive specialist training at the Savoy Butler Academy in London. They will also have a dedicated VIP travel concierge team who will ensure every detail of their travel experience, including ground transport, cuisine, and amenities, are tailored to their requirements. Nine First Apartments will be installed on the upper deck in a 1-1 configuration to create the only single aisle first class cabin in the industry. Each First Apartment, which has a 64 inch high sliding door, includes a reclining armchair and a full-length ottoman, both upholstered by the prestigious Italian suppliers of Ferrari’s interiors, Poltrona Frau. The ottoman transforms into a separate 80 inch long fully flatbed. The First Apartment, which also includes features such as a chilled mini-bar, a personal vanity unit and a swivelling TV monitor for viewing from either the seat or the bed, has a 74 per cent larger footprint than the airline’s current award-winning first class suites. A fully equipped shower room is available on the A380 for exclusive use by first class customers. 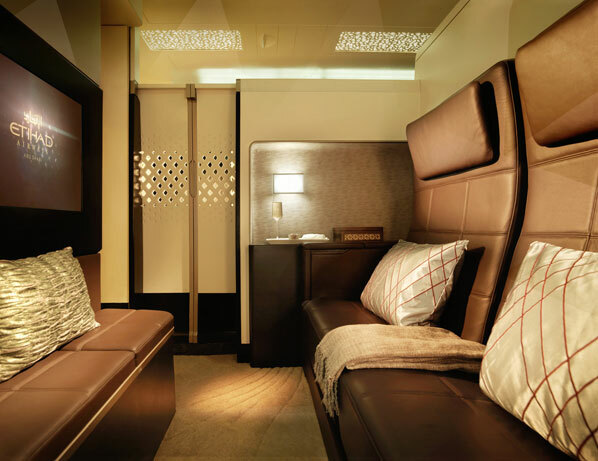 On the B787, Etihad Airways has designed an enhanced First Suite with many new features. The eight First Suites in a 1-2-1 configuration along a curved aisle, another first in commercial aviation. On the centre seats, the armrests retract and the suites can be joined to create a ‘double’ bed. Other features include a chilled mini-bar and a 24 inch TV monitor. The TV has a USB connection so it can be used for sharing content or it can also be set to the airline’s live news and sport TV channels. New Economy Smart Seat will offer an ergonomic fixed-wing headrest, to give customers a place to rest their head for added comfort and relaxation. The seat also has a lumbar support feature, allowing customers to adjust their seat comfort, and an 11 inch personal monitor screen, with all the IFE peripherals conveniently set into the seatback in front. In all entry-ways in both aircraft and in all cabins, the galley equipment is concealed behind custom Arabic fretwork screens and blinds, while the trolleys are covered by elegant wood-finish doors, setting a stylish and welcoming environment for all customers. Importantly for the airline’s Muslim customers, Etihad Airways has developed prayer areas which can be curtained off for privacy and are equipped with a real-time electronic Qibla-finder showing the exact direction of Mecca based on the aircraft’s geographical position. In the premium class boarding areas, Etihad Airways will collaborate with cultural institutions in the UAE to exhibit artwork and artefacts in display cabinets installed throughout. Items from the Etihad Airways duty free catalogue will also be displayed.